Slack recently raised $250 million on the backs of 9 million weekly active users. We aren't talking sign-ups or ad-hoc users: we're talking 9 million people who log in to their Slack account, each and every week. Slack's team—and its investors—understand the power of great product adoption. They know that it's a prerequisite for every performance metric that matters — customer retention, user engagement, revenue—and they work hard to consistently get users to their “aha!” moment, taking their product from a nice-to-have to a staple of their daily routine. With such a huge impact, improving product adoption should be your number one priority. So we're sharing five proven strategies to help all of your users—from new sign-ups to old hands—use your product more effectively. 1. Create an unforgettable first user experience. Your customer's first experience sets the tone for every experience after. With so much at stake, it's your job to demonstrate the usefulness of your product as quickly as possible—whether that's helping them to schedule their first social media post or track their first backlink. To do that, smart companies use welcome messages, in-app tutorials, and tooltips to create a clear path to value, no matter how complex their product. In the case of Quora, for example, the product's value isn't clear until you've put in some work to tell it what kind of topics you're interested in. Once your feed is filtered to just your favorite subjects, suddenly the whole product makes sense. New users could easily be overwhelmed by the mass of questions that appears when they first start using the product, but a single, contrasting tooltip appears to encourage users straight towards an “aha!” moment: upvote posts you like, and your feed will become more and more personalized to your interests. For someone who doesn't know how to use Quora, this tooltip offers a compelling path forward that explains both an action (“liking”) and the value that it will bring the user (their feed will become more personalized). A new user doesn't need to understand anything more about Quora to know that performing this simple activity—liking—is going to bring them value. 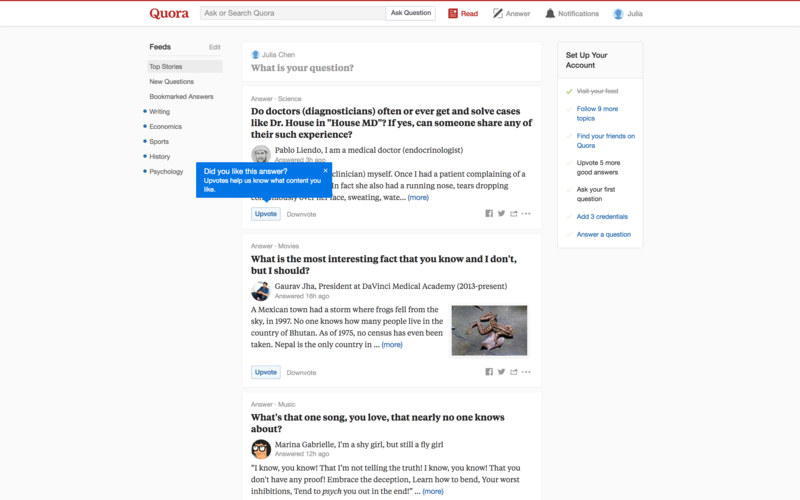 The more likes they hand out and the more personalized their feed gets, the closer new Quora users will be to seeing how the platform is supposed to really work. While Quora benefits from a single use case—ask and answer interesting questions—Clearbit's features can be used in hundreds of different ways. To create a truly unforgettable first experience, the company tailors its onboarding process to the individual needs of each customer. To do that, Clearbit uses data enrichment to segment its customers by role. Developers get enrolled in a developer-specific onboarding process, while marketers get another, completely separate, set of emails and tutorials. From minute one, new users are shepherded to the parts of the tool that they'll find most useful while avoiding distractions that can come from irrelevant functionality. Instead of hoping for a great first experience, Clearbit has taken charge, doing everything it can to guarantee it. 2. Treat every new feature like a mini product launch. Products evolve over time. We learn which parts of our product drive engagement and which get overlooked; we update existing features and release brand-new functionality. Each of these changes impacts product adoption, either helping the process and adding new ways for users to hit their goals, or hindering it and adding more complicated, unclear features that customers can't understand. To maximize product adoption, every new feature should be treated like a miniature product launch. Even if your existing customers are veterans of your product, they're completely inexperienced when it comes to a new release, and they'll benefit from the same hand-holding you'd offer a new user. 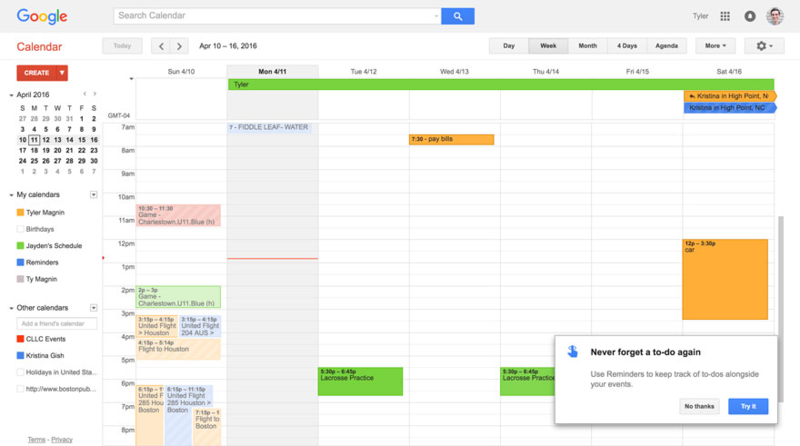 Google took this approach with the addition of Reminders to its Calendar app. Instead of assuming its userbase would know how and why to use the new feature, it used a pop-up modal to launch a short, focused tutorial. The tutorial takes place directly in the app itself, maximizing the number of users who are made aware of the release, and minimizing the effort required to actually start using the feature. If a user shows no interest in the notification, it's quick and easy to dismiss the pop-up; but if they want to learn more, they can jump straight into a hands-on tutorial at the click of a button. 3. Support the in-app experience with behavioral emails. Product adoption is the pursuit of a habitual user experience: we want people to use our product in a way that's consistent and completely automatic. For a social media management tool, we want users to log in every time they share a post to LinkedIn; for an SEO tool, every time they have a question about search performance. But like any habit, product adoption needs to be reinforced by repetition. Emails offer an easy way to achieve that repetition and leverage the mere-exposure effect. By sending emails that echo the advice offered in our in-app tutorials, we can increase the likelihood of a user acting on it, whether we're suggesting they try out a new feature or finish connecting their social media accounts. Each email was triggered in response to a relevant in-app action: when a user signed up for the product, they received an email explaining how to install the company's widget on their website; when the widget was installed, they'd receive tips on using the widget to generate customer reviews. For the customer, this creates a seamless “flow” through the product. They receive clear, timely guidance at every step of setup, and each successful action is immediately followed up by a logical “next step.” There's no need to work out what happens next: they can simply follow the instructions and start enjoying the product. 4. Use hyper-targeted onboarding to boost feature adoption. It's likely that most of your app's value will come from a handful of key features—it's the 80/20 principle in action. Some features might be too advanced for the average user (how many Excel users can create macros? ), while others—like integrations with third-party tools—might only appeal to a certain subset of customers. But great product adoption means fixing these “weak spots” and finding ways to boost engagement with your entire product—no matter how complex or niche the feature. Segmentation provides the solution. When AdRoll released an integration with MailChimp, it knew it had a limited audience: MailChimp customers. Triggering a mass onboarding tutorial would alienate as many users as it would help, so the company used a data analysis tool to identify users with active subscriptions to both AdRoll and MailChimp. 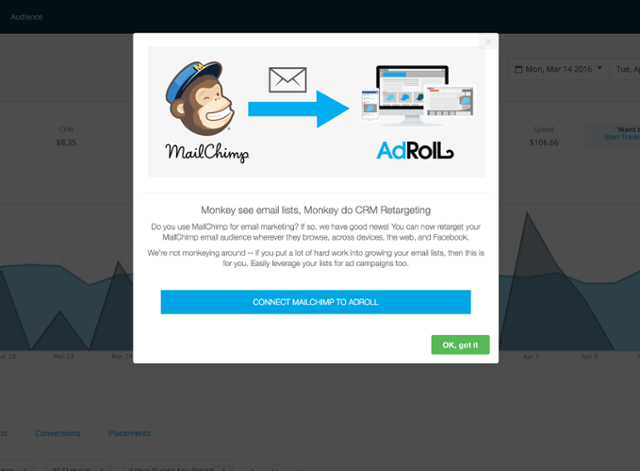 AdRoll then developed a pop-up modal promoting the integration and triggered it when its segment of MailChimp users hit its dashboard. It explained the benefits of the integration in clear, concise terms (“retarget your email contacts in AdRoll”), and made it quick and easy for users to get started, with a call-to-action that begins the integration process, straight from the pop-up. Instead of hoping that MailChimp users would stumble on the new release, understand the benefits, and know how to get started, it made the process as direct as possible. It worked: one of its most “niche” features netted a staggering 60% adoption rate. 5. Find, fix, and repeat. Sometimes, product adoption can be hindered by a specific, acute problem. Your latest feature might seem too complex to use. In-app navigation might be making others hard to find. You might even be signing up poor-fit leads. With thousands of users, finding and fixing these problems isn't always straightforward. Aggregated user data provides insight into macro-level problems, whether it's a drop in Daily Active Users (DAUs) or a decline in customer retention rates. User behavior shines a light on micro-level problems, showing which features are going unused. Our cluttered navigation bar is making our latest feature release hard to find. 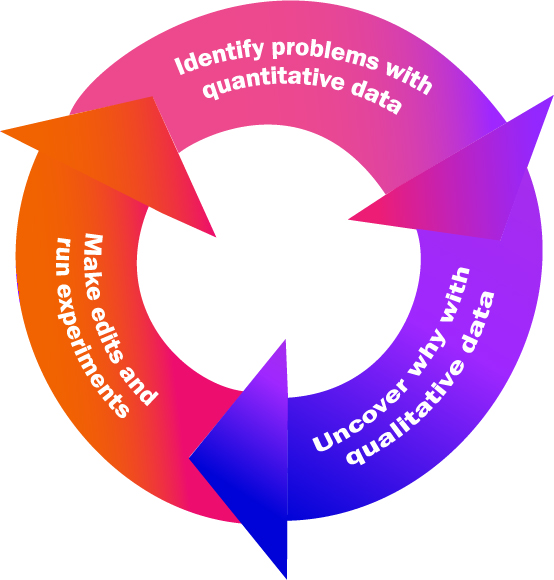 By continually collecting data and feeding into the flywheel, we can create a systematic framework for improving product adoption. Instead of waiting for our active users to dwindle to nothing, we can take action at the first sign of a problem—boosting engagement at every step of the customer lifecycle. Make product adoption your new priority. Instead of cobbling together a rough-and-ready onboarding tutorial, you need to fixate on creating a standout first experience. And instead of viewing product adoption as a one-time problem, you need to improve engagement throughout the entire customer lifecycle—helping new customers and seasoned users alike get more from every one of your app's features.